What differentiates humans from other animals is a question that has long occupied scholars in the life sciences and humanities alike. For the conservation biologists, farmers, and indigenous Adivasis I met during my ethnographic fieldwork at a wildlife sanctuary in South India, it is precisely the resemblance of certain animal species to humans that puzzles them in their daily lives. Wild Asian elephants in particular are renowned for their almost-human cleverness in this region of the Western Ghats of Kerala. Working and living side by side with elephants, both scientists and forest dwellers highlighted the exceptional intelligence, cognitive abilities, and social behavior of these large pachyderms. 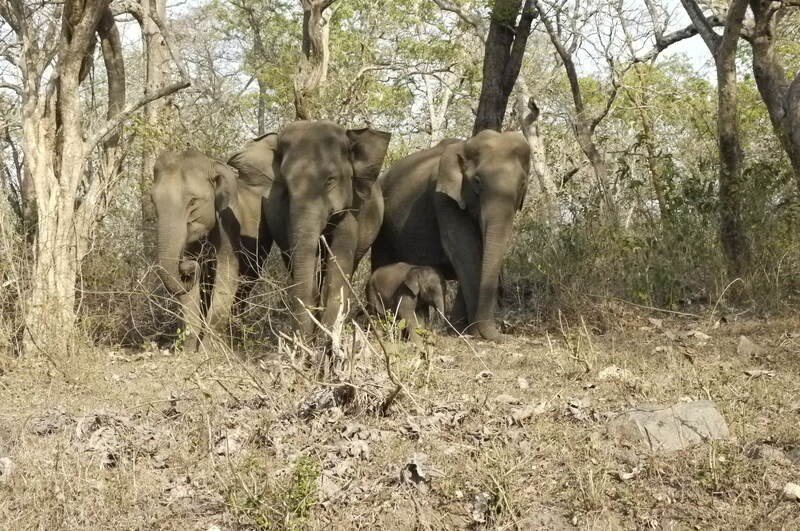 These traits make elephants unpredictable actors in wildlife conservation, and their abilities pose enormous challenges for mitigating the severe human-elephant conflicts in this densely-populated and fragmented forest landscape of South India. “They are just like us” was the judgment frequently made regarding elephant behavior by small-scale agriculturalists, who encounter wild elephants on an almost-daily basis on their paddy fields, coconut plantations, and vegetable gardens at the border of the Wayanad Wildlife Sanctuary. 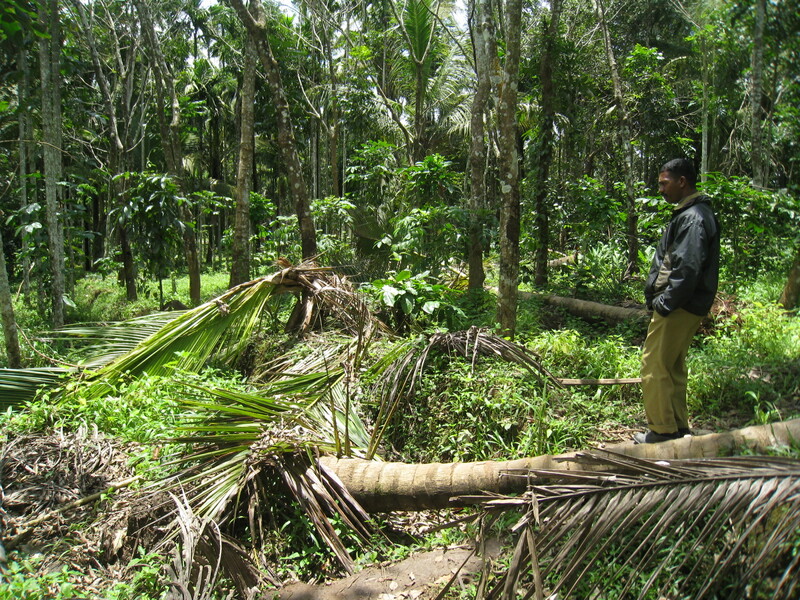 Coconut trees destroyed by elephants. 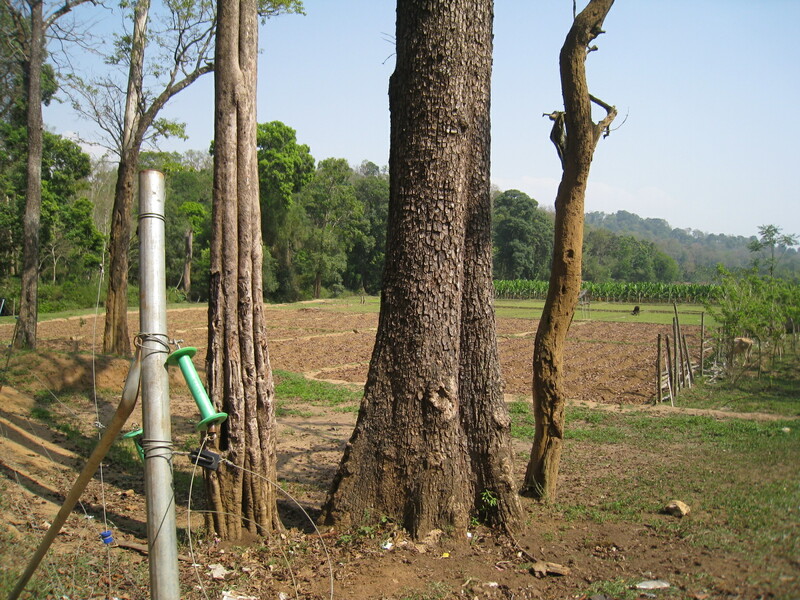 The elephant trenches and electric fences that the forest department built for their protection are not of much use in preventing the hungry herbivores from entering the farmer’s agricultural fields. “The elephants observe us humans and quickly learn from us how to overcome all hindrances that we have set up to keep them away,” a young man told me who had just lost a large part of his yearly paddy harvest after an invasion of an elephant herd during the previous night. He recounted having observed a new technique recently through which elephants have learned to cross the deep elephant trenches that the forest department had dug for protection. “They imitated us humans,” he commented, recounting how the large animals balanced over the narrow plank that reached over the trench, and used their trunk to grab the wire that served as a handhold. 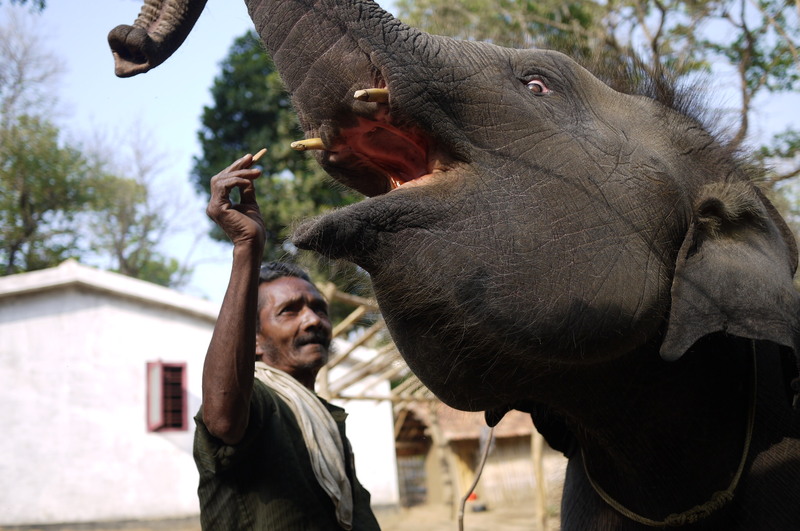 On numerous other occasions during my fieldwork, local residents excitedly told stories about the astonishing intelligence [budhi], adaptability, and fast learning abilities of elephants, enabling them to access the cultivated crops that they had developed a taste for and that quickly provided them with large amounts of energy. 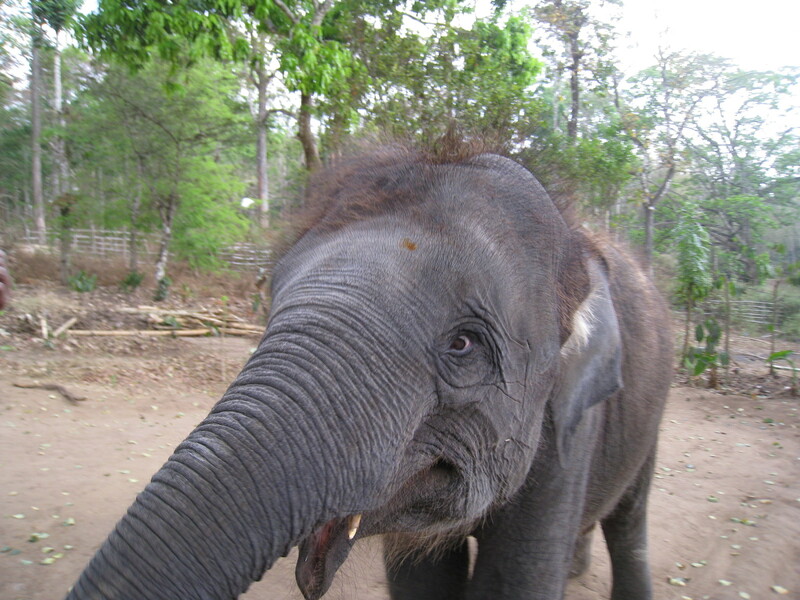 Especially during the rainy season, when jackfruits and mangos were ripe and the paddy was about to be harvested, elephants found ways to jump over high walls in an agile fashion, fell tall trees to tear down electric fences, and move to the spots where the sanctuary’s trenches and wires were permeable, permitting the elephants to trespass. The elephants’ astonishing ability to learn and adapt to new situations was one of the main reasons people at the forest frontier in Wayanad drew cross-species parallels and recognized resemblances to humans. This perspective was shared by behavioral biologists, foresters, and wildlife veterinaries working in the region, who asserted that elephant’s “almost human intelligence” and their human-likeness were the main reasons why human-elephant conflicts proved so difficult to mitigate. “We keep on coming up with new technologies to scare elephants away and prevent them from entering the fields. However, after a month, they already know how to circumvent the barriers and hindrances. Each year the elephants jump over walls that are higher and trenches that are deeper,” a former Wildlife Warden told me in despair. The “elephant-scaring device”, which he invented to imitate the roaring sound of a tiger (an animal that elephants have frequent altercations with) to scare crop raiders from the fields at night was only useful during the first few applications. Very soon, the crop raiders became accustomed to the resonance and realized that nothing serious would happen to them while grazing on the fields. 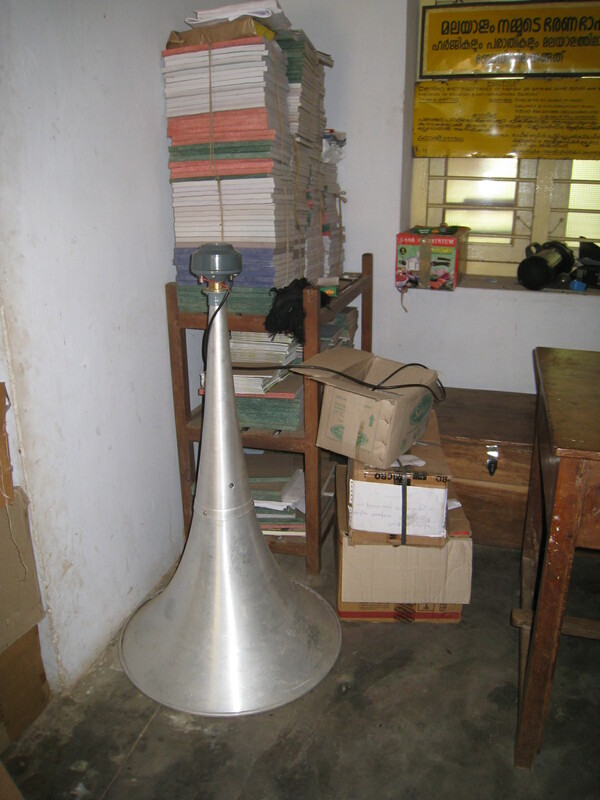 Elephant-scaring device imitating tiger roar. Like the wildlife scientists and foresters, the mahouts (elephant handlers) with whom I spent much time with during fieldwork had no doubt that elephants shared many of the characteristics that distinguish us as humans. The mahouts’ intimate daily relationship with the animals persuaded them that their trained (kumkhi) elephants were “intelligent just like us.” Because of elephants’ identifiable personalities and their ability to display humor, feel grief, express emotion, remember events even many years in the past, show social behavior, teach their calves, and act with strategy, elephants were seen as closely-related to humans and were ascribed personhood. We should love (snehikkanam) them [the elephants]. Then they will return that love to us. We should always keep close to the elephant. You should not keep a distance and should not fear the animal. Then it will love you. If you fear them, they will keep a distance from you. Mahout with his orphaned elephant. Additionally, my interlocutors in Wayanad viewed the exceptional memory of elephants, in combination with their ability to acquire behavioral traits though social learning in a specific herd, as an important cause of the region’s worsening wildlife conflicts. According to the wildlife veterinarians in the region, elephants do not forget the traumatic experiences of violent conflicts with humans over agricultural fields. Elephants remember events from a young age onwards, and their individual characters are molded through their conflict-ridden interactions with humans. Furthermore, elephant calves learn crop raiding habits and aggressive behavior towards humans from the experienced cow (matriarch) who leads their herd. Crop raiding behavior is thus a behavior that small calves already acquire through social learning in their mother’s herd. Consequently, the humans of Wayanad have learned to be very creative in finding ever-new ways to prevent elephants from entering their fields and destroying their livelihoods. Farmers experiment with different technologies to drive away their hungry visitors. For example, as pachyderms react sensitively to the burning qualities of Capsaicin, farmers have planted chili peppers alongside the elephant trenches and fences as deterrent, which proved to be effective in some parts of Africa and other regions of India (see a recent article in the Guardian). In the forest areas of Wayanad, however, chili pepper was never planted with much success, especially because the region’s monkey population (equally keen to feast upon the agricultural crops) is very fond of the spicy plant and eats it with delight. During my last visit to Kerala in 2013, a different human invention attracted people’s attention and raised new hopes for enabling human-elephant coexistence. A resourceful beekeeper in Wayanad found out that his honeybees could provide an unexpected solution to human-elephant conflicts. Elephant’s strong natural aversion to the high buzzing sound of bees is effectively used in Kenya to keep the large mammals from farmers’ fields. Indian bees, Apis cerana indica, the bee keeper told me, make three different buzzing sounds; especially when they are angry, their buzz is very fierce. Searching the internet, the Indian beekeeper got inspiration and technical advice from the African experiment (http://elephantsandbees.com/beehive-fence/) and established a 700-meter beehive fence all along forest-bordering fields frequently raided by elephants. As soon as the elephants hit the fence, he reported, the bee hives fall to the ground and the angry buzz of the insects drive the pachyderms away. With the side effect of producing “elephant-friendly honey,” as the bee keeper described this marketable product, many farmers might turn towards this answer to appease the violent conflicts with the intelligent non-human counterparts at the forest frontier in South India. Let’s hope that it will take a while for the elephants to outsmart the newly established “insect-technology”. Note: all photos were taken by and are the property of the author.